As you will realize, this article presents many questions which can only be addressed by more observation which will have to be next winter. However even though it is incomplete I feel it may be of interest. On Sunday, March 18 the Springtails in Redmondville were having a great time on the surface of small pools of water that had formed on the road as you can see in # 3. 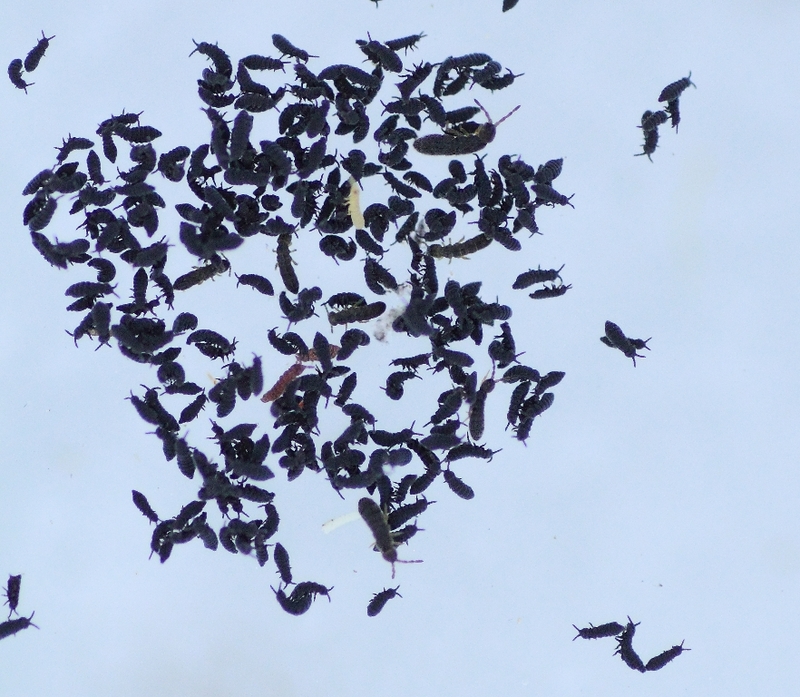 As you can also see in # 3, many of the Springtails have maneuvered themselves into positions whereby they are either on top of or sideways to a neighbour(s). My theory is that they must sense that there is something solid under their legs before the spring is released. 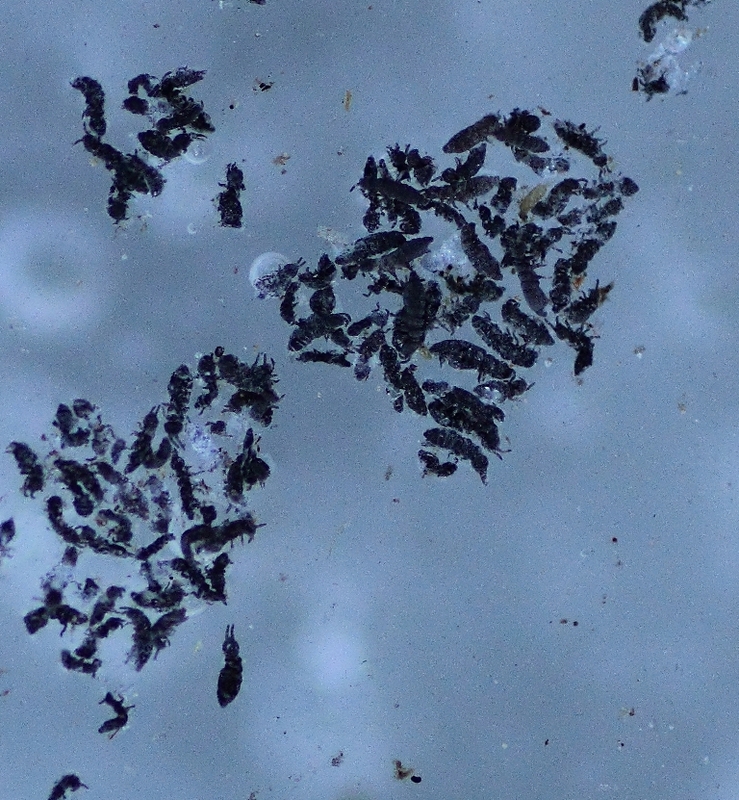 One website I visited said that Springtails can use their springs in water but I didn’t observe that in this case. Unfortunately in most cases the melt water that was running down the sides of the depressions in which the pools had formed, carried those who had successfully catapulted out of the pool back down into the water. I went back on Wednesday, March 21 to get some more photos. 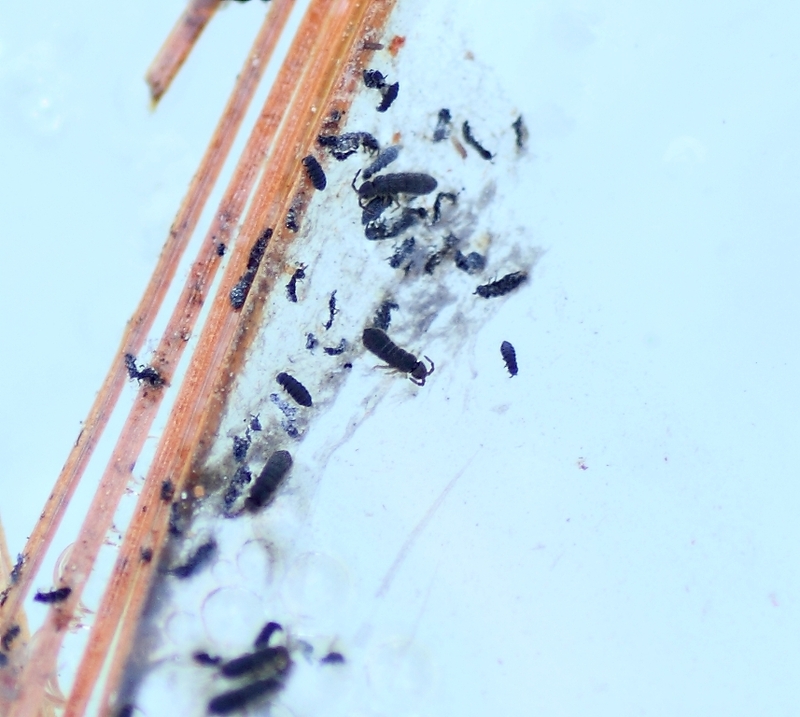 From a standing position Springtails were visible but upon taking a closer look, I discovered they were dead, as can be seen in # 1 and # 2. My thought after seeing them on the water on Sunday was that since they were making use of the water surface tension, they would be able to disperse after the water froze underneath them. However I didn’t know how complex events could possibly be as this happens. Also I tried to find out if insects that use surface tension can get trapped as the water freezes but I had no luck. Isn’t it likely that anything that makes use of surface tension could be easily trapped due to the water expanding and freezing around the parts of the leg (such as minute hairs) that make dents in the surface tension? 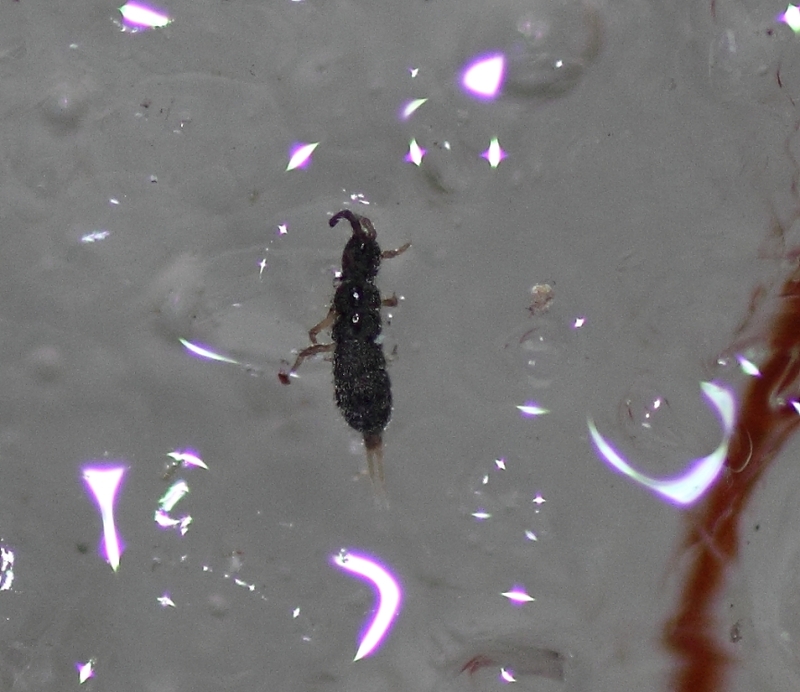 Do the hydrophilic Springtail claws which penetrate the water surface get stuck in the ice that forms above them as the air temperature drops? There may be evidence in # 1 that this is what happened. It appears to me that some of the bodies are missing legs or parts of legs. What do you think? Compare # 1 with # 3. Did this happen as they tried to struggle free? The ice and snow melted during the day and as the volume of water built up, some bodies were swept downstream. # 2 is a photo of some that were caught by pine needles laying in the water flow. There were also many bodies located upslope from the channel which may have lost flotation as the water level dropped during the downward erosion of the channel. On March 24 with the temperature dropping below zero, I visited the road again. Again there were many bodies on the ice surface. I have attached a photo of one with its furcula (spring) showing (#4). This led me to think that the spring may have been used in trying to free itself and because of its position at the rear of the body it would tend to lift the rear end. Consequently the rear and middle legs might be apt to be torn off in this activity. Eventually there might only be one leg left intact but trapped by ice. I stand corrected about them springing off the water. On March 24 I did observe one doing so.